Can the Ducks Go From the Hunter to the Hunted? People say that pressure makes diamonds. Fans of Oregon football hope that’s the case in 2019. After a couple of years flying under the radar, the Ducks are firmly back in the national picture. They stunned the country with their blistering recruiting performance, locking in a top-10 class for the first time in program history. 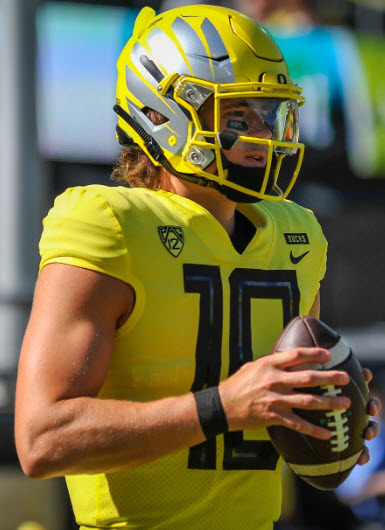 And they were the talk of the town when superstar quarterback Justin Herbert announced he was returning for his senior season. 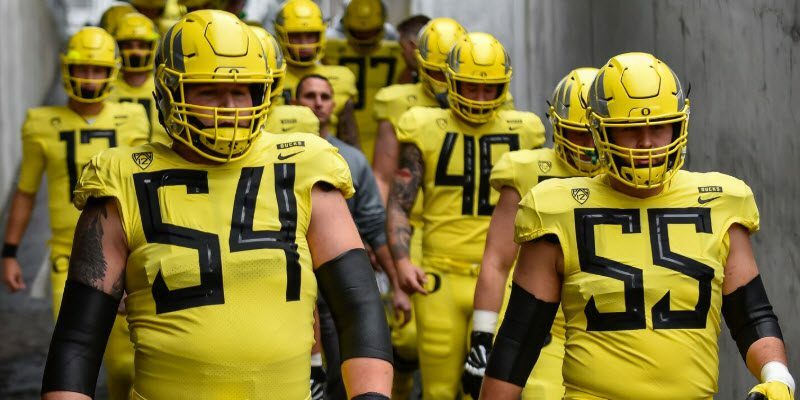 Expectations are mounting; many have the Ducks pegged as conference favorites in 2019. That’s quite the shift from where they found themselves a year ago, when their goal was simply to retain a head coach for more than a year. Are they ready to go from spoiler to headliner? If they hope to remain in the spotlight for more than just a single offseason, then they better be. Tony Brooks-James was one of the players tasked with replacing Freeman. Although they had a handful of lackluster performances, the Ducks played well in 2018, all things considered. They were, after all, playing under their third head coach in as many years, installing a new offensive scheme and replacing the school’s all-time leading rusher, Royce Freeman. To earn nine wins under such circumstances, especially when they won only four just a couple of years ago, was a solid achievement. Most people around the country weren’t expecting the Ducks to make a deep conference run anyway. After all, Stanford had Bryce Love and a seasoned offensive line returning. Washington had a boatload of talented players on both sides of the ball with lots of experience. And even USC garnered preseason hype as a team to watch in the South. While the Ducks did have the benefit of a comically easy non-conference schedule, there were far too many question marks, and too many established contenders in the Pac-12, to expect them to perform any better than they did. But that won’t be the case in 2019. Nearly every “Way Too Early Top 25” poll across the country has the Ducks listed in the top 15, and many have the Ducks as the favorite to win the conference. Their 2018 season was a good stepping stone, but the stakes have been raised. Now, the Ducks have everyone’s attention, and a “solid” season won’t be enough to satisfy a championship-starved fan base. Things have changed for the conference-champion Huskies, who have to replace nearly their entire starting defense and many of their talented playmakers on offense, including their decorated, four-year starter at quarterback, Jake Browning. While they’ve recruited well enough to stay relevant, many expect a drop-off with such a green group of players. Costello will have a lot on his shoulders in 2019. Stanford is always a tough out, but it may not have the firepower this season to be considered a legitimate contender. 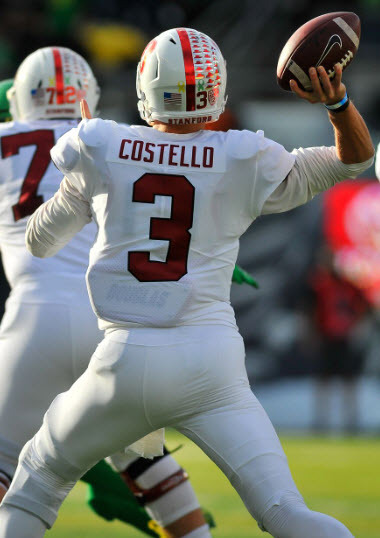 Without Love and “Oregon arch enemy” JJ Arcega-Whiteside, solid but unspectacular quarterback KJ Costello bears more responsibility than ever before. He’s a talented player, but can he carry the team on his shoulders to navigate an increasingly competitive North division? And can he do it with a defense that has lost its edge in recent years? It seems like every year the Washington State Cougars are counted out, and every year they find a way to exceed expectations. But eventually, their talent disparity will be too much for even the great Mike Leach to overcome. In 2018, they found lightning in a bottle, securing graduate transfer Gardner Minshew. Minshew proved to be a perfect fit in Leach’s air raid offense. Now, he is gone, and although there’s assuredly another young gun waiting in the wings — Leach always has one — it’s unrealistic to expect him to lead one of the weakest rosters in the conference to contention in his first season. Utah is one of the few teams in the conference that has a legitimate case to be considered a championship contender. The Utes have most of their starting lineup returning, and they’ve been a consistently solid program since they joined the Pac-12. But their back-to-back losses to end 2018 raise concerns about their ability to perform on the big stage. They were good enough to win a weak South division, but they looked out of place against the good-not-great teams that they played outside of the division. They’re a team to watch, but their ceiling appears to be limited. As for the Trojans, they’re nothing short of a train wreck. They’re coming off of their worst season and worst recruiting class in years. Their on-field product is stale. And they’re still recovering from an offseason that saw their newly hired offensive coordinator remain on staff for a couple of weeks before he jumped ship. They’ll get their share of votes in the opening AP poll, and they’ll likely underperform, as they have done nearly every season since Pete Carroll left. 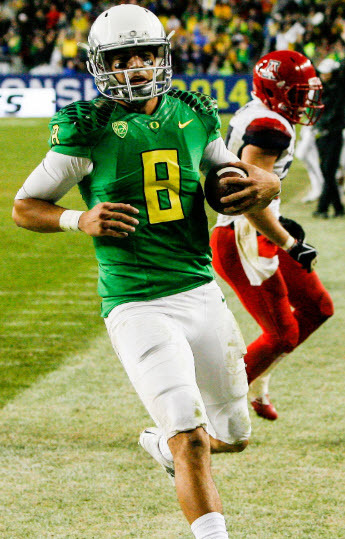 Herbert’s return makes the Ducks title contenders in 2019. That leaves the Ducks as the surest bet to win the conference. While they’ll have to replace departing stars Jalen Jelks, Justin Hollins and Dillon Mitchell, there’s certainly no doubt that they “won” the draft season. 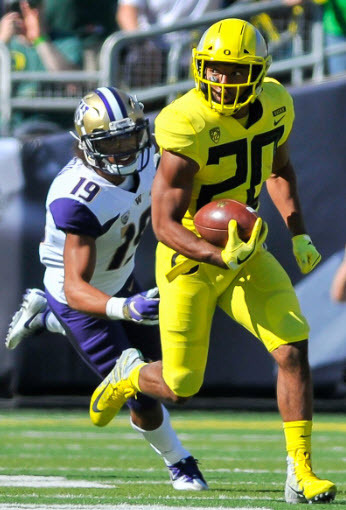 None of their four draft-eligible starting offensive linemen decided to make the jump to the pros, ball-hawking linebacker Troy Dye opted to stick around for his senior season, and most importantly, Herbert spurned the draft for another year in Eugene. Overall, the Ducks have all but one of their offensive starters from a year ago returning, and they have nearly their entire secondary coming back as well. Of course, there are issues that surfaced in 2018 that will need to be corrected. But all things considered, the Ducks have the best combination of talent and returning production in the conference. Couple that with perhaps the best quarterback west of the Mississippi, and it’s no wonder that many are predicting that the Ducks will win their first conference championship since 2014. Can the Ducks Turn Hype Into Results? As great as it is to see the Ducks once again considered conference-title contenders, all of this offseason talk is just that: talk. It’s been five years since the Ducks last won a conference title. The Ducks played admirably last season, but they did so with far less pressure than they’ll face this year. It’s one thing to put together a solid season when few are paying attention, but it’s another to play at a championship level when everyone is watching. That will be one of the biggest challenges the Ducks face in 2019. They haven’t been in the national spotlight since the days of Marcus Mariota and company. Now, whispers of Oregon being “back” are spreading like wildfire across media circles. They have the talent and experience to deliver on the sky-high expectations. When they put everything together, like they did for the majority of their game against Stanford, or in their victory against Washington, there’s no question that the Ducks have what it takes to run the table in a conference without a headliner. But can they play at that level week in and week out, with a much more rigorous schedule and with much more at stake? The answer to that question will determine whether the Ducks are truly the contenders that many proclaim them to be.